Instead of big plastic lawn signs, Guelph mayor candidate Aggie Mlynarz decided to use paper posters for her election campaign. She said she’s going signless for now, after she wasn’t able to recycle signs in the past. “We showed up at the material recycling facility… and they don’t take them,” said Mlynarz. She felt her decision to forego the signage would be a testing opportunity to see the feasibility of the decision. “How are we going to change the game unless we make these fundamental decisions, down to, ‘how do we campaign?’” she said. Incumbent Mayor Cam Guthrie said he has put out close to 1,000 lawn signs during this year’s campaign. “I think they’re great because people want to show their support,” he said. Guthrie estimated that 90 per cent or more of his signs have been reused from his previous mayoral campaign. He and his team opted to add re-elect stickers and to paste his updated website onto them over having new signs made. Shirley Lichti, a marketing professor, toted the value of using lawn signs. She said that the more signs a voter sees, the more likely they are to look into a candidate. “There’s some name recognition that goes along with it,” she said. While Mlynarz is skipping traditional plastic signs, she is working on a different kind of lawn sign that she said she would reveal in time. 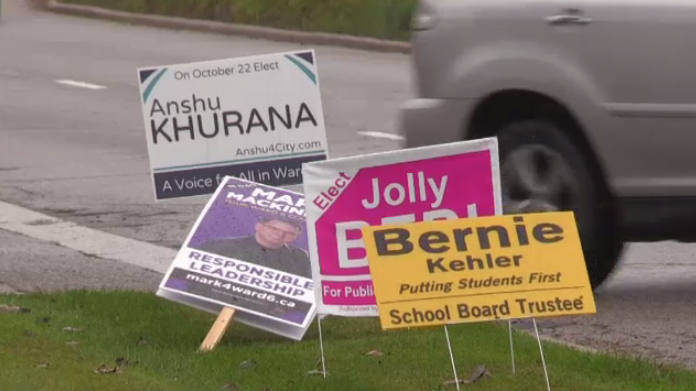 Two mayoral candidates in Guelph are taking different approaches to reducing sign waste.